I know a lot of people have asked for this third an final instalment on how to use Group Policy to manage home page settings and so I have finally been able to find some time to finish this series of posts. Just to recap in Part 1 I showed you how to configure home page setting using the administrative templates native policy and in Part 2 I showed you how to do this using Group Policy Preferences. 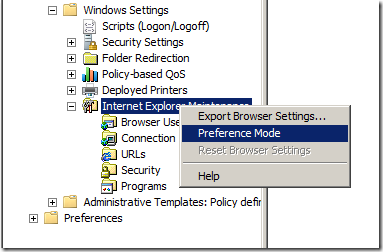 In this post I will show you how to configured Internet Explorer home page settings using the Internet Explore Maintenance (IEM) group policy setting option. 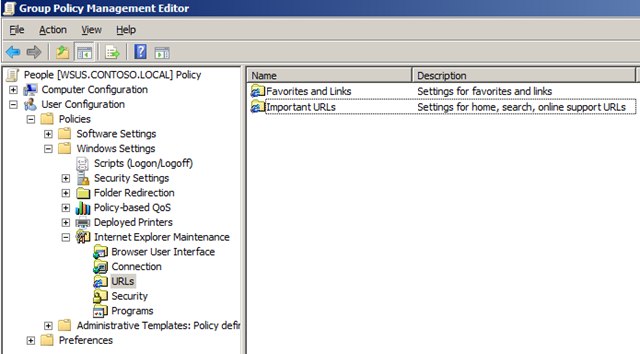 The IEM policy setting has been in Group Policy since the very beginning and is now a depracated setting as you can tell by the now various other methods of configuration home pages as outlined in Part 1 and Part 2. So if you are configuring this as a new setting definitely look at using the native Administrative Template or Group Policy Preferences first. However the one advantage of using IEM is “Preferences Mode”…… Huh… I hear you… Well this is the OTHER Group Policy Preference (see below) and this option only applies to Internet Explorer Maintenance settings. The advantage of the Preferences Mode settings is that once the home page is configured the user will be able to change the home page to their own “Preference”. 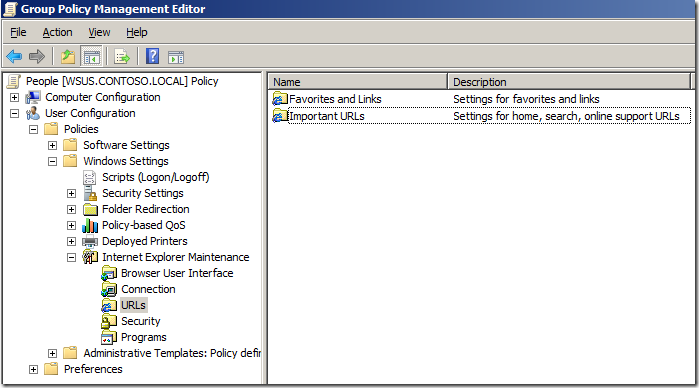 To configured the home page edit a Group Policy Object (GPO) that is targeted to the users you want to configured. Then navigate to User Configuration > Policies > Windows Settings > Internet Explorer Maintenance > URLs and double click on “Important URL”. 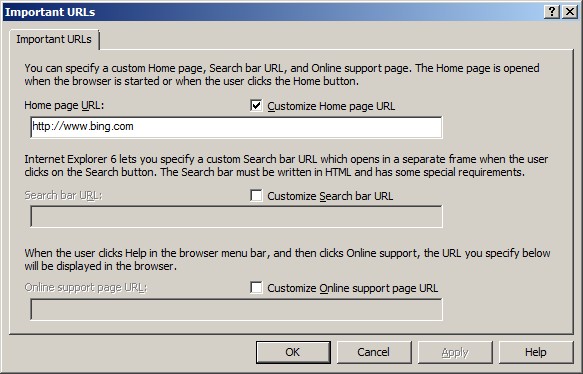 Now simply tick “Customize Home page URL” and type the URL you want configured as the home page in the “Home page URL:” text box. Now the users home page will be configured to the URL you configured above. Now this is the SUPER COOL thing about setting… If you have enabled Preferences Mode and you configured the “Disabled changing Secondary Home Pages setting” that I talked about in Part 1 your users will be able to make a change the Primary Home but you can still force the URL of any of the secondary home page tabs (see image below where the users has change the Primary home page to Yahoo but the Google Secondary page remains). AWESOME! Thanks for you very helpful information, one query however..After we have implemented the secondary home pages there was a requirement to change one of them. After the update was made, the new page appeared and the old page for all users is still showing?? So instead of 2 tabs we have 3 now and ones dead…! Is this expected behaviour? Or an issue with roaming profiles and redirected folders as newly created users are fine? I am not sure… sounds like you might be right that it has something to do with roaming profiles… have you tried reseting the profile? or a new user top see if you only have two tabs? I followed instruction above. Preference Mode is enabled. 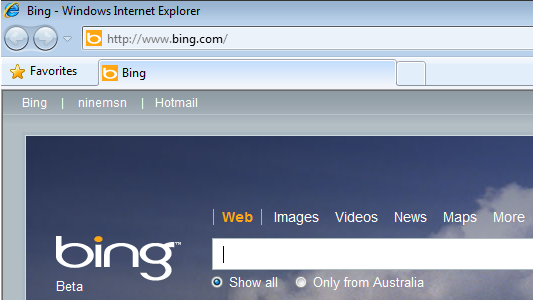 However, user can’t change home page on the primary tab or any tabs. Please help. First I want to thank you very much for posting steps of group policies..
can you please tell me how to configure a group policy for windows central update. I have followed the instruction to set a preference mode setting but the homepage settings is still disabled for the users. What I am planning on implementing is a Primary homepage (editable by the users) and a default secondary(non-editable by the users)homepage. What I have done is set the Primary homepage in Important URLs (Preference mode ) setting and the Seconday in Admin Template- Windows Components-Internet explorer- Disable changing secondary homepage settings. I have force updated the GP, also re-looged in but the homepage settings are greyed out and users not able to change the primary homepage settings.